So much of that reminds me of Bonzo. Especially the paragraph about letting off steam. Though, that said, we have had a good weekend, and Bonzo, apart from one minor (because I jumped on it) tantrum enjoyed the party with his school friends. Though as you say, I was on red alert the whole time just in case! Thank heavens for wide open spaces & picnics! They do understand...and they've now read this too, so hopefully 'get it'. My son would have struggled too it's so hard having a autistic son (not sure if that's your sons problem or not but this is mine) for years before his diognosis I blamed myself it must have been me right, Now I know what's wrong I can work on things that work for him we still have hard days but we have brilliant days too. Thanks for your comment. Mini isn't autistic, he has an attachment issue, but a lot of the signs are quite similar. Indeed when he was younger we thought he was autistic, but now know the differences. The brilliant days make the hard days easier don't they? I also loved reading about 'Twinkle Twinkle Little Star' and your heart-melting moment. 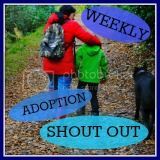 We read about this in some of our adoption literature, personalised songs to sing to children about how special they are to us, but you made it come alive with that lovely story. Thanks for your comment. I'm not sure how loving I felt at the time, but it was definitely the right thing to do for Mini, and also for our friends. I'm quite sure it would have been unpleasant for them if he started to misbehave (albeit uncontrollable). My son (now 10) is autistic. He's much calmer now but when younger we always were on high alert when out and about like you and also refused many social occasions as it would have been too much for him and we would not have enjoyed it at all as we would have been following him round all the time and stressing about things like ponds! It took us a while to realise that all the things everyone else did (and we had done with our older 2 children) were not enjoyable for him and a quiet activity with some 1 to 1 attention from a parent was much better than a big social gathering. It took me a while to realise that the weekly toddler gorup wher I had been with his older brothers and met and chatted with my friends was a nightmare for him (big noisy echoey hall with other kids hogging the toys) and he much prefered sitting by the village pond feeding the ducks. Friends did not understand why we turned down invitations but we stood firm and decided that we would not go looking for stress and had to put his needs and the contentment of the whole family first. You did the right thing not going as you would have resented him for spoiling it or remembered it as a bad experience.